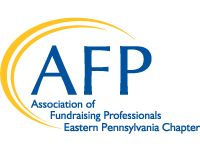 One of the benefits of your membership in the Eastern PA Chapter of AFP is participation in the Mentor Program. No matter how long you have been in fundraising, we all have new skills to learn and successes to share. Our objective is to develop our future leadership within the field of fund raising and within the Eastern PA Chapter. The program is designed to last for six (6) months. Interested students will be matched up with a mentor. Mentors are development professionals with at least five years experience in fund raising. A student may sign up anytime as long as there is a mentor available. Both students and mentors must be AFP members. Students will be matched with mentors based on their particular needs, the area of expertise of the mentor and the type of organizations for which they both work. This working relationship is the primary foundation upon which this program is built. Time commitment: 2-8 hours a month as jointly determined by student and mentor. All Mentors and Students must be chapter members and complete the attached application to participate.